A global telecom provider is now achieving unprecedented improvement in operations performance as a result of leveraging real-time metrics automation by PureShare. Prior to PureShare, operations reporting was managed by six report analysts, each responsible for the collection and consolidation of performance metrics from various management systems including systems management tools, multiple service desks and several contact centers. 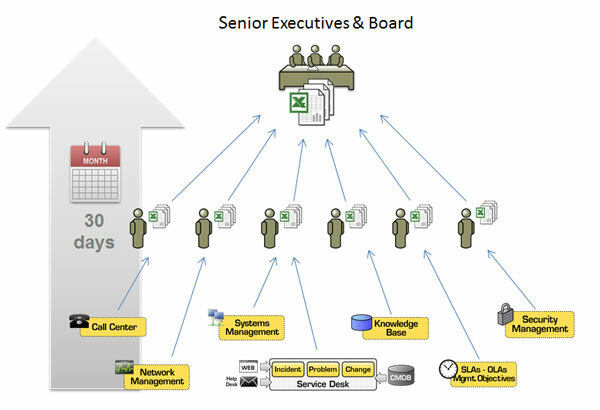 The work was manually intensive and required interaction between the report analysts to deliver a snapshot of operations performance to executives approximately 30 days later. The work involved knitting together data from 16 different areas of operations. Each area required a summarized briefing book with scorecards, all manually assembled from the Excel report extracts derived from the various systems. This exercise consumed approximately 1,000 hours of work a month, every month. PureShare’s MetricsBridge was used to automate the collection and consolidation of metrics from various back end systems. The last remaining manual spreadsheets were handled with input forms created with MetricsBridge. 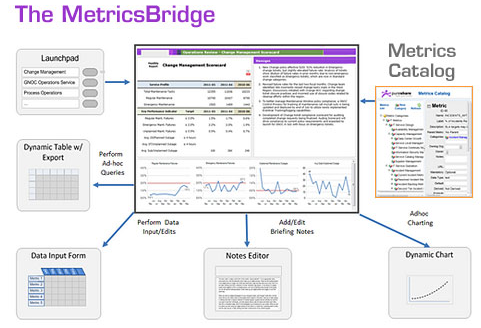 The Metrics Catalog within the MetricsBridge was leveraged to create a set of formula-based metrics derived from automatically sourced metrics. The catalog-based system ensures that any new compound metrics needed in the future may be simply configured administratively with no coding required. In addition to input forms, the MetricsBridge contains a system to manage the flow of briefing notes from managers in one level of the organization to the next. Briefing notes are used to annotate scorecards with text-based summaries explaining variances in performance. Today, stakeholders simply click on a launchpad to see performance summaries in real-time. With no latency, decisions can be made to materially affect outcomes such as service level commitments to customers. From 1,000 hours of effort a month to a single click, PureShare delivers value beyond compare. Contact us today to see how we can save your organization time.